Egypt has set out an ambitious national development agenda, positioning itself as a champion of the Sustainable Development Goals (SDGs) in the Global South. Nevertheless, progress on sustainable development has been challenging in Egypt’s current economic climate. Macroeconomic reforms taken in recent years—including those connected to a loan from the IMF—are severely straining living standards for average Egyptians, with millions experiencing serious social and economic rights deprivations. However, the daily reality of those being left behind is not being captured by the narrow set of economic indicators that are used to assert that the Egyptian economy has “turned the corner.” This partial picture is problematic because it ignores rising poverty, inequality and socioeconomic exclusion. A new metric, developed jointly by CESR and its partners in Egypt, offers a more multidimensional view of the socioeconomic situation in Egypt and its human impacts. 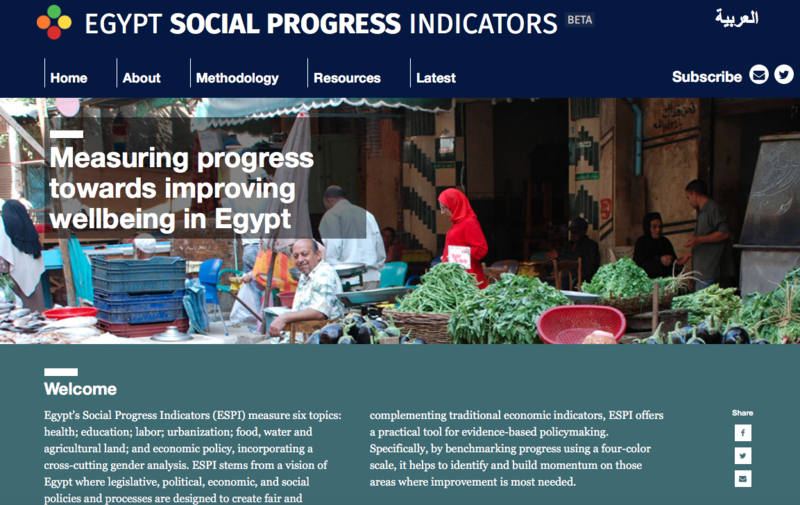 Egypt’s Social Progress Indicators (ESPI) measure six topics: health; education; urbanization; food, water, and agricultural land; and economic policy; a cross-cutting gender analysis is incorporated throughout. It will use a four-color scale, to score progress against benchmarks informed by national and international development targets, as well as human rights commitments, including recommendations from human rights mechanisms which Egypt has taken on in recent years. By measuring progress in this way, ESPI helps to pinpoint and support advocacy on those areas where improvement on economic and social rights is most pressing. Rights fulfillment has typically been considered difficult to measure, which has been used as an excuse to exclude it from government performance frameworks. ESPI demonstrates that human rights can provide concrete criteria for evaluating government policies. Importantly, it provides a “home grown” metric for measuring rights fulfillment, offering a nuanced assessment of the situation in Egypt that reflects the priority issues for civil society groups. In so doing, ESPI seeks to be of use to a broad range of actors and audiences by offering a practical tool for evidence-based policymaking. One of the most distinctive aspects of ESPI is its methodology, which was designed collectively over three years through a series of face-to-face workshops and online activities coordinated by CESR to facilitate skill-sharing, tool development and prototyping. ESPI analyzes socioeconomic progress through the four dimensions of OPERA—CESR’s monitoring framework addressing Outcomes, Policy Efforts, Resources and Assessment—to illustrate the effects that laws, policies, and budgetary decisions have on people’s everyday lives. It includes a mix of fact-based and analytical indicators, measured using quantitative and qualitative data, in order to give a holistic picture of social progress. For CESR, collaborating with the Egyptian academic researchers, field experts, and civil society groups from different sectors who are deeply involved with the day to day reality of Egyptian social and economic conditions, has been an incredible learning experience, from which we’ve drawn a number of important lessons. First, ESPI has highlighted the value of working with partners across different disciplines to monitor development progress through a human rights lens. The organizations and individuals involved span a range of perspectives and expertise, from agriculture to urbanization, and from food to fiscal policy. Economic and social rights provided a unifying conceptual and normative framework around which to converge in the assessment of progress. It has also yielded lessons about how an international NGO like CESR can add value to a nationally-led advocacy project. A key contribution that CESR made to ESPI was to share the research methodology and advocacy expertise that we’ve honed in different contexts, in ways that enabled our partners to approach the economic and social rights challenges they see as most pressing in a new and innovative way. Specifically, supporting our partners to develop indicators and benchmarks, based on OPERA, provided a structure for communicating their deep contextual expertise more systematically and more effectively for the audiences and intended users they had identified for ESPI. As civic space in Egypt continues to be restricted, CESR plays a leading role in the coordination of this work, providing the stability needed to advance with ESPI through a sustained long-term partnership with the diverse range of individuals and groups involved—a collaboration model based on mutual trust, working on equal footing, privileging local expertise, and tailoring strategies to context. Third, ESPI has highlighted significant lessons related to navigating the use of technology in human rights advocacy. Egypt is a very tech-savvy society, and web-based mobilization is particularly important, given restrictions on organizing. Nevertheless, developing an online tool has been a new type of project for almost everyone involved. We were extremely fortunate to be able to connect with Aspiration, who provided invaluable support through the process of designing ESPI. This included conceptualizing the project’s digital strategy; engaging a skilled developer; and incorporating digital security practices into the project. ESPI is an innovative digital tool that enables a range of actors to track progress in the implementation of commitments Egypt has made regarding economic and social rights and sustainable development, commitments reflected not only in these international recommendations but in its Constitution and national development plans. As a methodologically rigorous, evidence-based and civil society-led resource, it is intended to help foster more informed, accountable and participatory decision-making on social, economic and development policies and their impact on people’s lives.